The unique nature of the Harvey House of Slaton allows it show up in places we’d never expect. Here’s an example from TexasPlainsTrail.com. We are reposting it for you to see, but the original article can be found here. During the heyday of the passenger railway system, train travel afforded a certain level of luxury and elegance now lost in today’s fast and furious modes of transportation. The comfort of rail travel, with its down-filled sleepers, white-linen dining cars, and drowsy, rhythmic staccato of steel wheels on tracks, made for pleasant and relaxing travel while surrounded by the creature comforts reminiscent of a fine hotel. But the train wasn’t the only purveyor of railroad luxury. 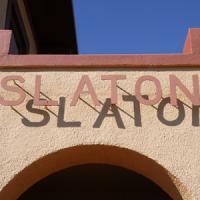 The Slaton Harvey House, a landmark Santa Fe railroad depot built in 1912 and located in the Plains Trail Region community of Slaton, offers an example of the services that once accompanied railroad travel. The Harvey House, part of a chain created by Scottish immigrant Fred Harvey in 1876, provided fine dining to passengers preparing to travel on the Santa Fe line, serviced courtesy of a bevy of hostesses known as the Harvey Girls. The two-story Mission Revival structure features concrete walls a foot thick and a parapet decorated with Santa Fe Railway symbols. Today, the Slaton Harvey House has been restored to its former status as host to travelers, providing bed and breakfast service and archive to artifacts and memorabilia of the Slaton railroad heritage.